Fidel Castro dead: How Cuba and America reacted? Los angeles : Cuban revolutionary Fidel Castro’s death on Friday sparked a series of comments from US President-elect Donald J Trump and other senior leaders across America. Trump was among the first major US political figures to comment on Castro's death. His Facebook post read: "Today, the world marks the passing of a brutal dictator who oppressed his own people for nearly six decades. Fidel Castro's legacy is one of firing squads, theft, unimaginable suffering, poverty and the denial of fundamental human rights. While Cuba remains a totalitarian island, it is my hope that today marks a move away from the horrors endured for too long, and toward a future in which the wonderful Cuban people finally live in the freedom they so richly deserve," he said. "Though the tragedies deaths and pain caused by Fidel Castro cannot be erased, our administration will do all it can to ensure the Cuban people can finally begin their journey toward prosperity and liberty." President Obama offered his condolences to the Castro family and extended "a hand of friendship to the Cuban people,"; his statement read:"At this time of Fidel Castro’s passing, we extend a hand of friendship to the Cuban people. We know that this moment fills Cubans - in Cuba and in the United States - with powerful emotions, recalling the countless ways in which Fidel Castro altered the course of individual lives, families, and of the Cuban nation. History will record and judge the enormous impact of this singular figure on the people and world around him. Today, we offer condolences to Fidel Castro's family, and our thoughts and prayers are with the Cuban people. In the days ahead, they will recall the past and also look to the future. As they do, the Cuban people must know that they have a friend and partner in the United States of America." Another starch conservative, Senator Ted Cruz reacted early this morning. He said, : "Fidel Castro's death cannot bring back his thousands of victims, nor can it bring comfort to their families. Today we remember them and honor the brave souls who fought the lonely fight against the brutal Communist dictatorship he imposed on Cuba." Former President Jimmy Carter said, "Rosalynn and I share our sympathies with the Castro family and the Cuban people on the death of Fidel Castro," Carter said in a statement. "We remember fondly our visits with him in Cuba and his love of his country. We wish the Cuban citizens peace and prosperity in the years ahead." Secretary of State John Kerry also issued a statement by saying, "As our two countries continue to move forward on the process of normalization -- restoring the economic, diplomatic and cultural ties severed by a troubled past -- we do so in a spirit of friendship and with an earnest desire not to ignore history but to write a new and better future for our two peoples." Powerful images taken in Cuba and Miami show the contrasting emotions that the death of Fidel Castro has brought to Cubans. 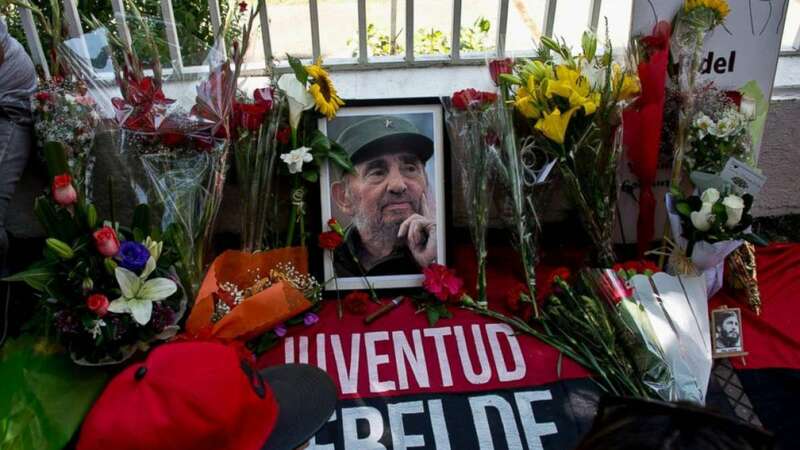 On one hand where Cuban Americans celebrated his death that finally they got a release from a dictator; native Cubans were pictured crying in the streets in memory of the polarising dictator, who has died aged 90.